Subterra Rolling Carry On 22"
The Subterra Rolling Carry On is the clown car of luggage: tiny outside, yet an inexplicably huge amount of stuff fits inside. 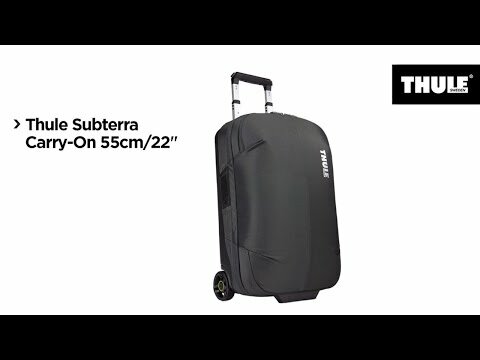 This rolling bag's secret sauce is the internal compression panel that uses a clever ratchet system to squeeze in extra clothing. It's waaay more effective than sitting on an overstuffed suitcase and crossing your fingers it will zip. Made of durable and water-resistant 800-denier nylon with a polycarbonate back panel and exoskeleton frame that stands up to bumps, scuffs and rough handling. Oversized wheels and telescoping handles provide great manoeuvrability for the mad dash from duty-free to the gate. Grab handles on all sides for easy lifting in and out of overhead bins or baggage carousels. Divided main compartment lets you separate clean from dirty, wet from dry or work from play. Internal compression panel lets you squish in even more stuff while preventing wrinkles. Zippered top pocket keeps your keys, wallet, phone and boarding passes easy to access. Built-in card slot makes your bag easy to to ID. Piggyback strap attachment loop lets you hook on an additional briefcase or backpack.